Until a few years ago, I didn’t particularly like Valentine’s Day. I didn’t appreciate being told to show affection in the form of underwhelming greeting cards, dining at crowded restaurants, and giving and receiving cliched gifts. Besides, didn’t we just wrap up Christmas? As I type this, I still have a handful of wayward ornaments and various other Christmas type things on a shelf waiting to be sent to the holiday bins in the basement. 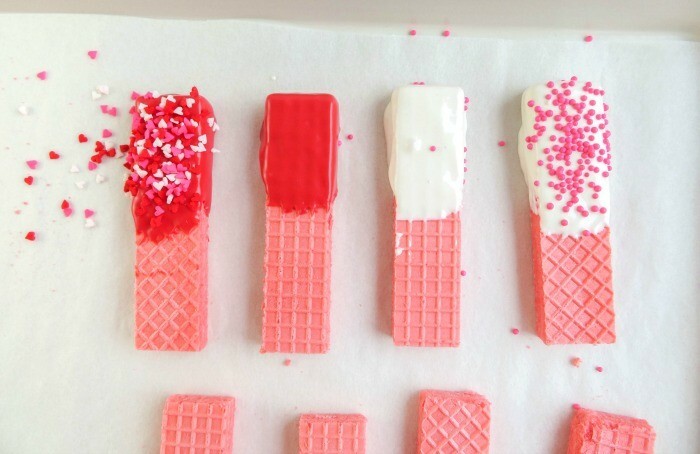 The old me certainly wasn’t going to make Valentine Dipped Wafers to mark Valentine’s Day. My kids are responsible for my newfound appreciation for Valentine’s Day. Kids do that, don’t they? Mine have softened my views on many things, from jumping in puddles to spiders that cross my path, and seeing the world through their eyes has made me more fun. I’ll never be as much fun as Dad, what with his indoor roughhousing and loose interpretations of cleanliness, but he’ll never make these delicious treats, so we both win. Now I see that Valentine’s Day, the feast day of a Roman priest who was jailed for marrying Christians (a serious crime at the time), is one to be celebrated. Love is worth celebrating. My form of celebration is a lazy man’s type of party. 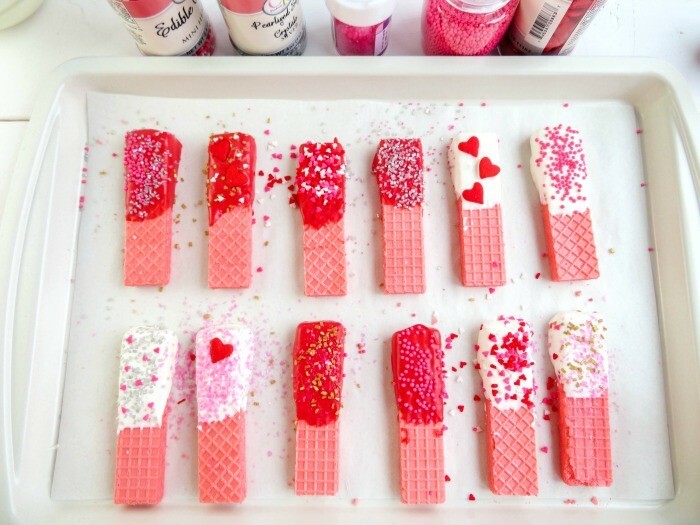 I like cute snacks as much as the next girl, but I also like easy projects and I adore ones my kids can help with, or do completely on their own, like these Valentine Dipped Wafers. 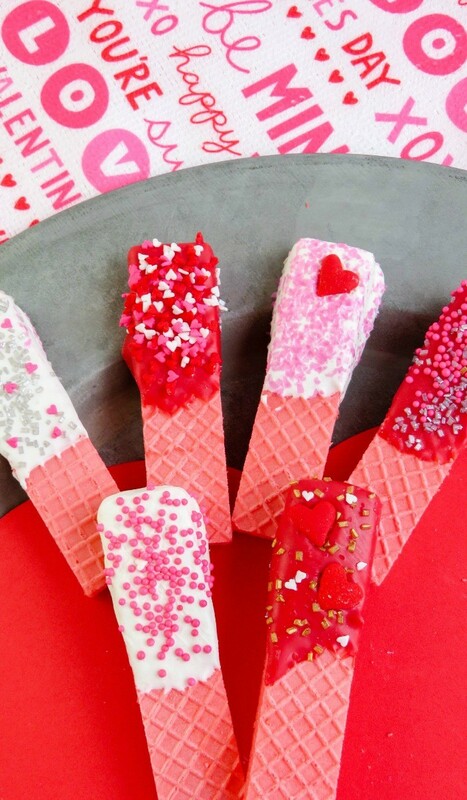 If you, like me, enjoy cute and simple treats, this is for you. 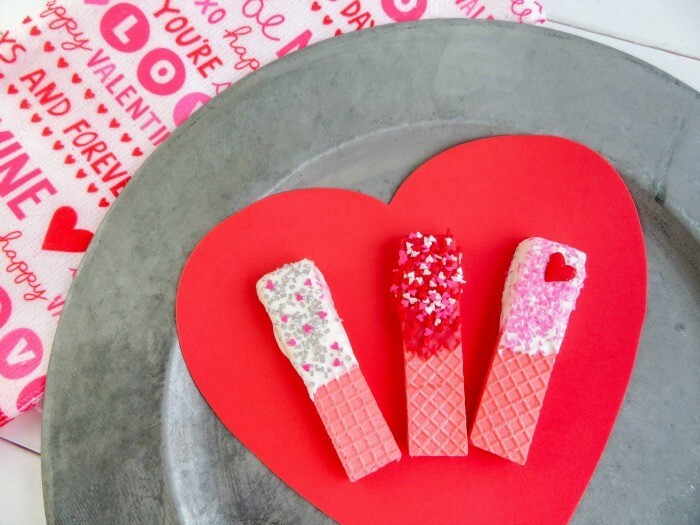 The decorated wafers can be placed in a goodie bag for friends and family, or are perfect for Valentine’s Day parties. 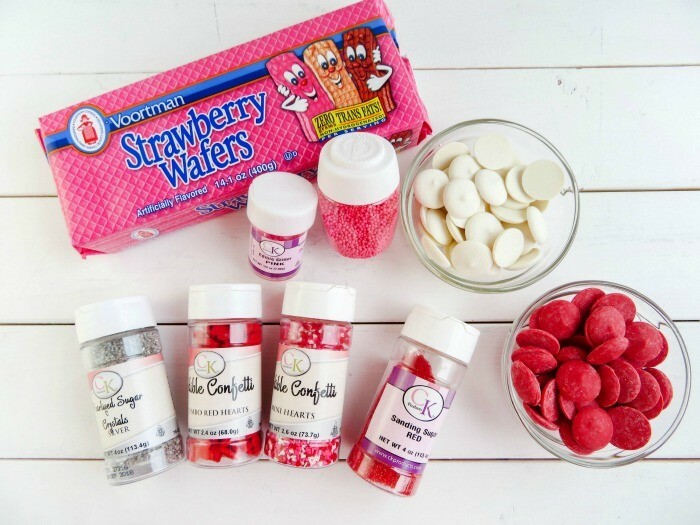 You could substitute strawberries or pretzel sticks for the wafers, and could use any type of holiday themed sprinkles for different celebrations throughout the year. 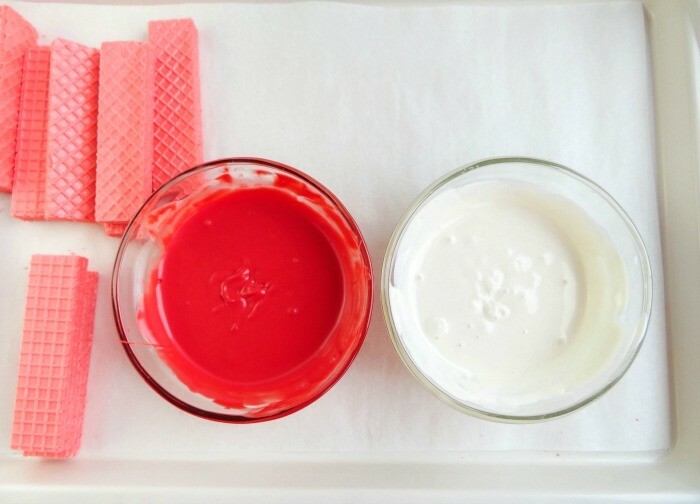 Place red candy discs in a microwave safe bowl. Microwave for 30 seconds, then stir. Continue to do this until discs are all melted. Do the same for the white discs. 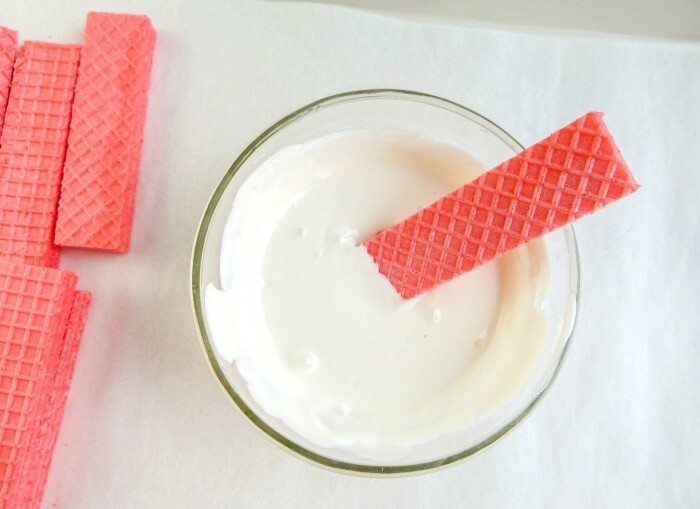 Dip the end of the wafer cookies in either the red or white chocolate. Lay them on a parchment lined cookie sheet. Add sprinkles/colored sugars before they dry. Let dry for about 10-15 minutes. 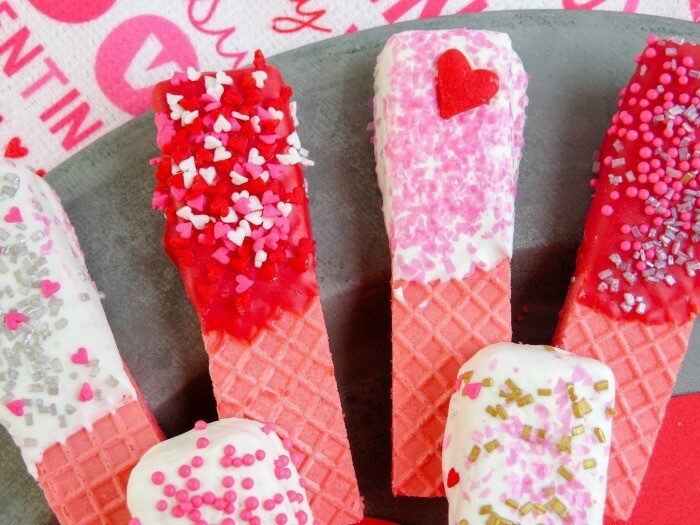 These simple treats are perfect for Valentine's Day!